Please enjoy my guest photographer’s photo from the single elimination yesterday, day 1 at the PWA Bonaire event. Jan Wachtmeester captured Tonky Frans mid air in his freestyle heat. Superb capture! To book your windsurf escape and learn to freestyle like the pros contact the Bonaire Specialists at http://www.bonairecaribbean.com. Ann Phelan the owner was the co founder of King of the Caribbean, Bonaire’s first pro event. She ran many PWA events in Bonaire and Cape Cod and understands the sport and the windsurf enthusiast’s needs when traveling to a windsurf destination. 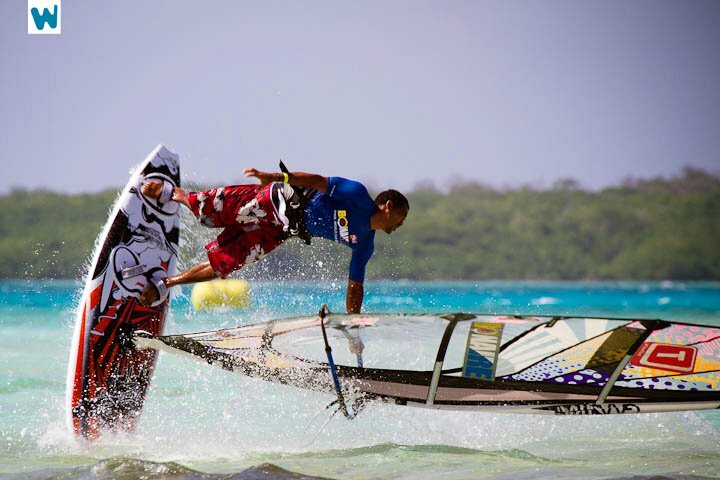 This entry was posted on June 13, 2011 at 12:48 pm and is filed under Windsurfing. You can follow any responses to this entry through the RSS 2.0 feed. You can leave a response, or trackback from your own site. Tonky is commentating on Continent Seven Live today!! He and Ben are a riot..quite hilarious …. thanks Deb…he is for sure a great photographer..